Friend! You make everything infinitely more fun. 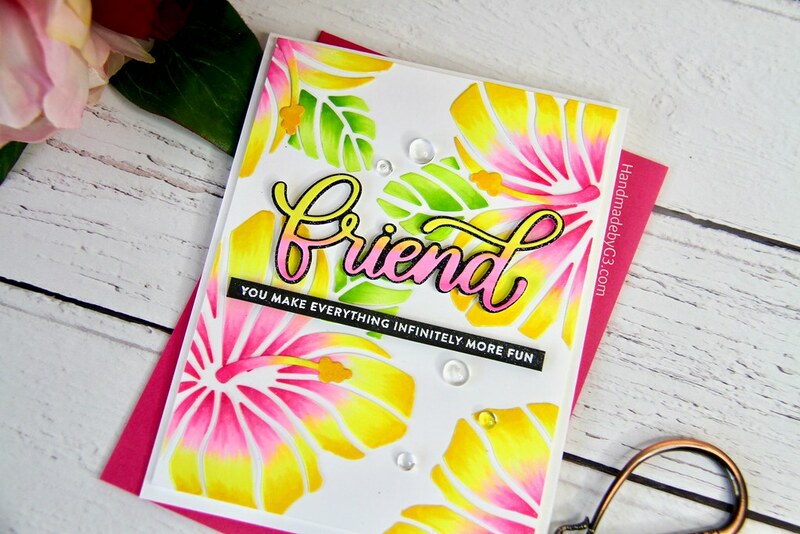 A quick post today sharing another Simon Says Stamp card using their new Good Vibes releases goodies. I love this release so much that I cannot put them down. 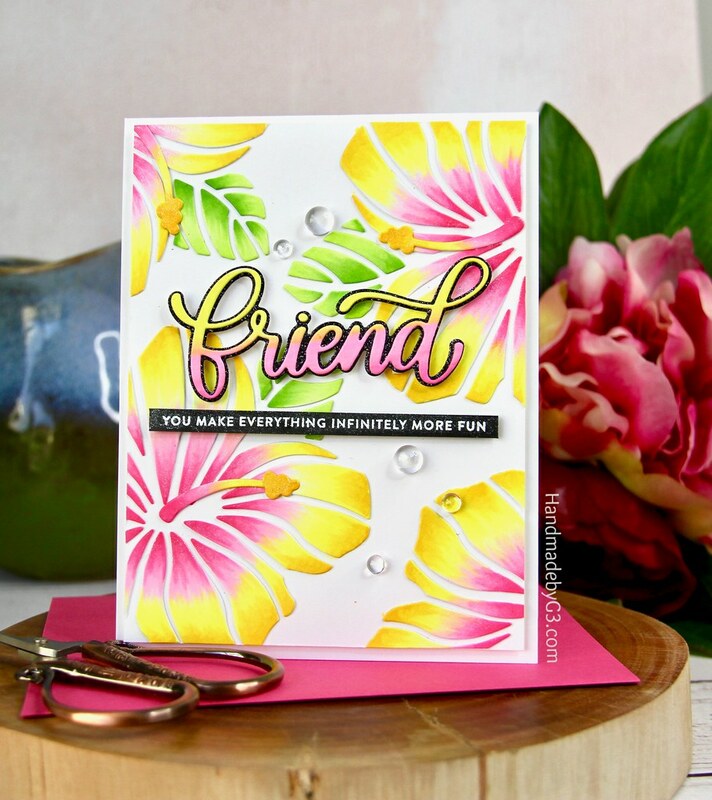 Here is a bright summer card for you today to brighten up the week. 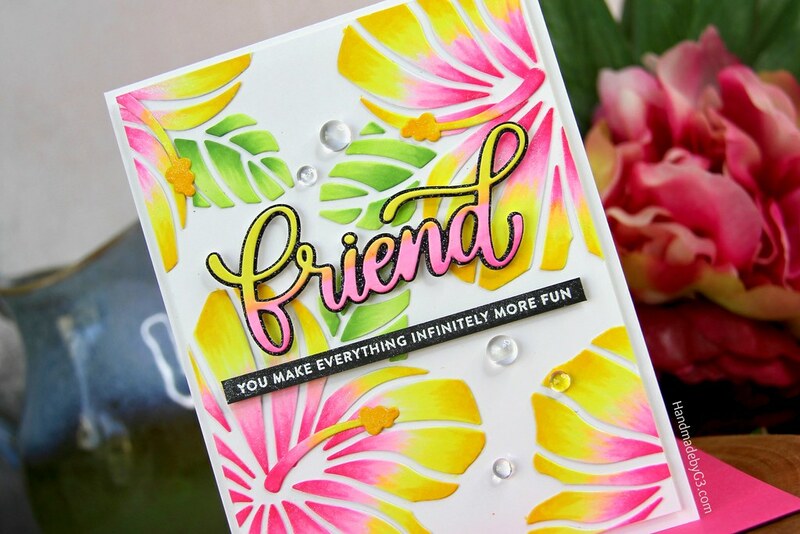 I have used the Hibiscus Frame die from Good Vibes collection here to make my background. Instead of using the frame, I used the negative pieces which I coloured using copic markers. I have listed all the copic markers I used below in the supplies. Using the frame die cut as a guide, I adhered the negative pieces in its place. After lifting the guide die cut, I trimmed off the over hanging pieces. I used three die cut negative pieces in all. By placing them off set on the white panel, the pattern feels like it is cut out of a large pattern paper. 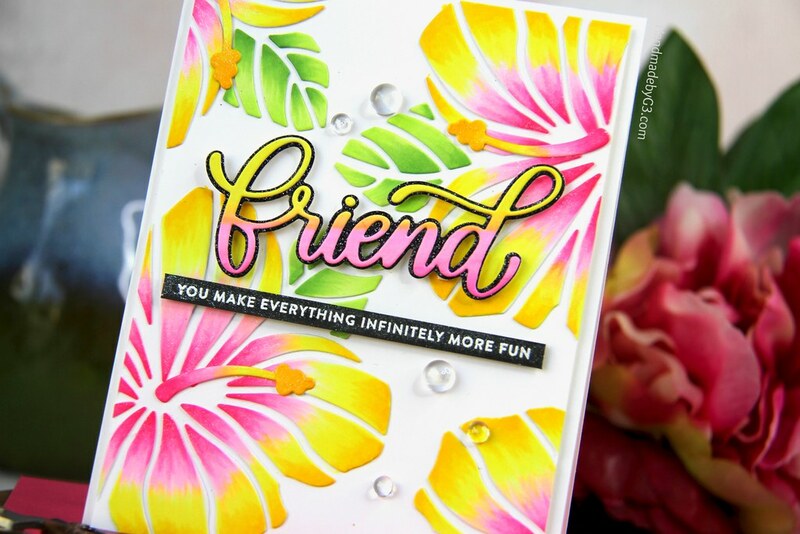 I brushed some clear shimmer on the die cut hibiscus. I adhered the background panel on a white card base using foam adhesive. For the sentiment, I coloured a piece of scrap white cardstock using the same yellow and pink copic markers I used for the flowers. 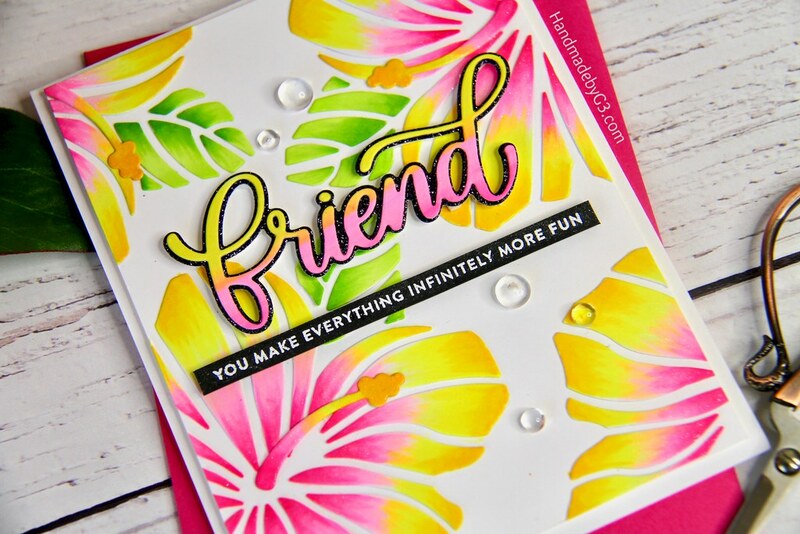 Then die cut the cardstock using the Big Friend die and adhered it on the Big friend back die, die cut using black glitter cardstock. I adhered this on the top centre of the card front. 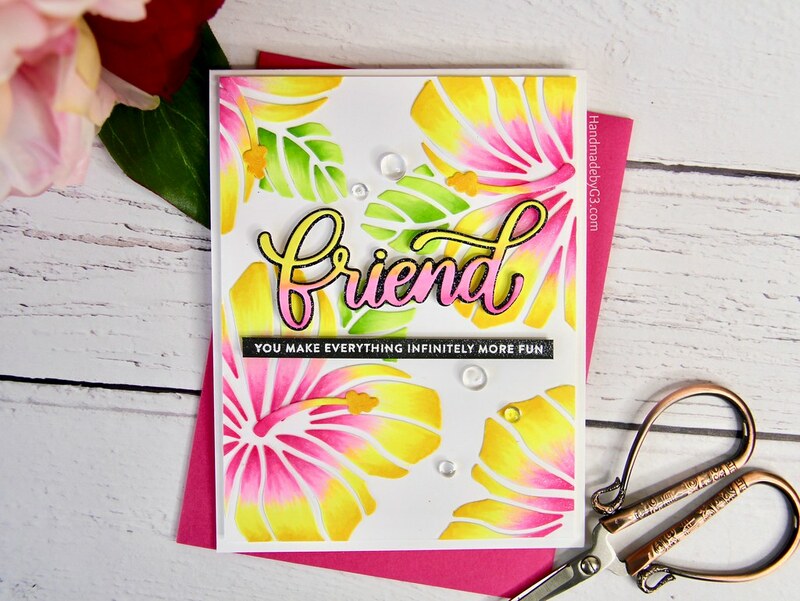 The secondary sentiment is from Vacation Time stamp set which I white heat embossed on a strip of black cardstock and adhered below the large die cut sentiment. Finally I embellished the card with some clear droplets. I love the bright colours on this card. My favourite kind of card too. Hope you like it. All supplies used to make this card are listed below.